This extension allows for changing the caption on editor tabs based on a template. The template can be changed in the Options, under the item "CustomTabNames". The template is made of variables with the form $(VariableName). Those are replaced by the appropriate value. Anything outside variables is kept verbatim. Variables can also contain a single-quoted string: $(VariableName 'string'). The string will be appended to the variable expansion if it is not empty. This is useful for putting a separator only if the variable is not empty. For example, $(ProjectName):$(Filename) will expand to project:file.ext if the file is in a project, but to :file.exe if it's not. Putting the colon inside the variable name fixes it: $(ProjectName ':')$(Filename) expands to file.exe if the file is not in a project. Name of the project that owns the document. 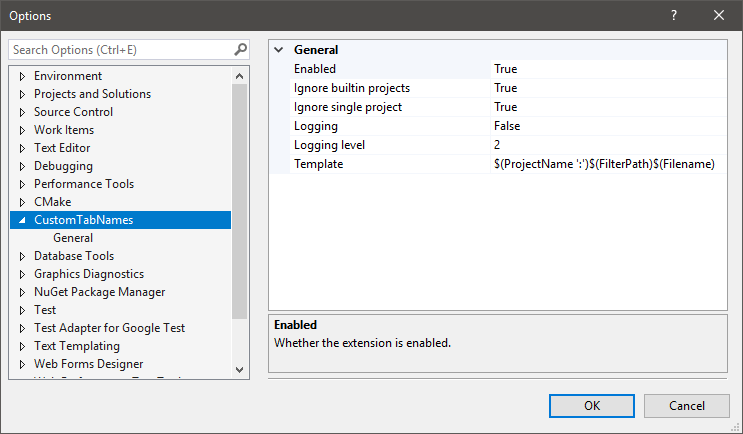 Can be empty if the option to ignore single projects is enabled. Name of the parent directory of the document. Does not include a terminating /. Can be empty if in root of filesystem. Full path of the document. All the parent folders for the document are joined, separated with /. Does not include a terminating /. 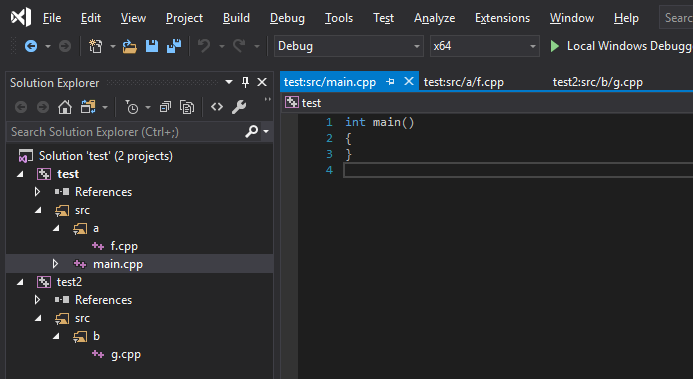 This uses the folders visible in the Solution Explorer, not the filesystem, although some project types may sync both (like C#). This does not include the project name, nor the filename. Can be empty if the file is directly a child of a project. Parent folder of the document in the Solution Explorer. Does not include a terminating /. Can be empty if the file is directly a child of a project. Options are under the item 'CustomTabNames' in the Options dialog. If false, all tabs are restored to showing the filename. Defaults to true. Some items are under dummy projects. For example, opening a file that's not in the solution puts it under a project named "Miscellaneous files", which would appear with $(ProjectName). When true, these dummy projects are ignored and $(ProjectName) will expand to an empty string. Defaults to true. Doesn't expand $(ProjectName) if there's only one project in the solution. Defaults to true. If true, a new entry "CustomTabNames" is created in the Output window with logs from this extension. Defaults to false. Sets the maximum level to log. 0=Error, 1=Warn, 2=Log, 3=Trace, 4=Variable expansions. Ignored if Logging is false. Defaults to 2 (Log). The template string used to generate captions. Defaults to $(ProjectName ':')$(FolderPath)$(Filename). Clone the project, open CustomTabNames.sln, build with the Release configuration. Open bin/Release/CustomTabNames.vsix, select the appropriate Visual Studio versions, and install. Tested on 2017 and 2019. CC0 1.0 Universal. This project is in the public domain.